May 1, 2018 - Reno, NV - NuLegacy Gold Corporation reports the retirement of Dr. Roger Steininger from his day-to-day role as Chief Geoscience Officer. Dr. Steininger leaves NuLegacy well-staffed with one of the best Carlin-style exploration teams in Nevada, having helped, amongst other recruitments, in the enrollment of Mr. Ed Cope, recently retired VP of North American exploration for Barrick Gold as a NuLegacy Director. Mr. Cope in turn was instrumental in the recruitment of former Barrick personnel Ms. Denise Dowell (as NUG’s Geotechnical Modelling Administrator), William Mounts (Drilling Supervisor) and most recently Mr. Charles Weakly, one of Barrick Gold’s top geologists and ‘gold finders’ as NuLegacy’s District Geologist. Mr. Weakley, together with NuLegacy’s Chief Geologist Derick Unger, are taking over responsibility for drill targeting. “On behalf of all of us I want to thank Roger for his genuine partnership in building NuLegacy”, said Albert Matter, NuLegacy’s Chairman, “during the process of which he has taught us all a great deal about these highly coveted and elusive elephant-sized Carlin-style gold deposits, while becoming a dear friend. We look forward to his continued sound input as a director”. Dr. Steininger is both a member of the Dean’s Council and Chair of the Geoscience Advisory Council of the Warner College of Natural Resources, Colorado State University. With an encyclopedic knowledge of the history of mining in the state of Nevada, Dr. Steininger intends to devote a good deal of his time to writing some of that history for posterity, as well as traveling with his wife of 51 years LuAnne, and spending more time with his family, all who live in Reno. About NuLegacy Gold Corporation: NuLegacy is a Nevada exploration company focused on discovering additional Carlin-style gold deposits on its premier district scale 98 sq. km (38 sq. 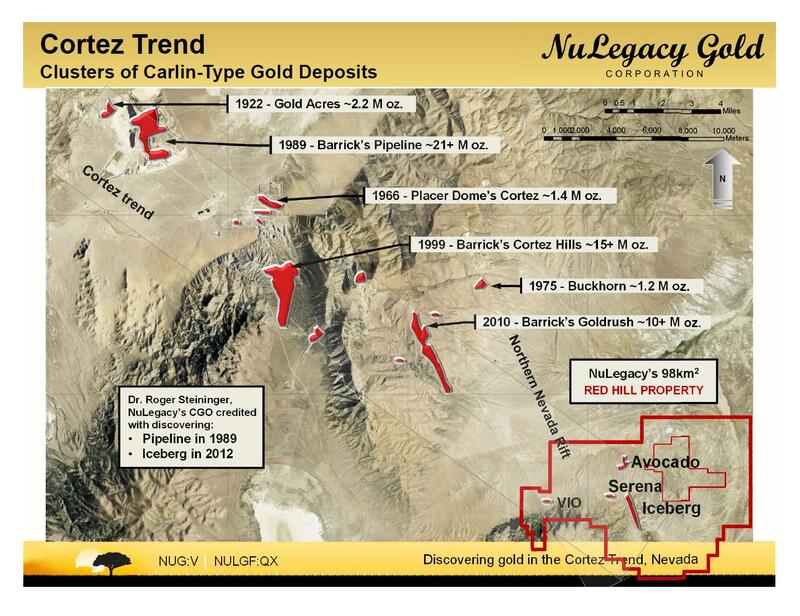 mile) Red Hill Project in the prolific Cortez gold trend of Nevada. To date NuLegacy has discovered the Iceberg Carlin-style gold deposits and has identified several more highly prospective exploration targets that are being drilled this year. NuLegacy’s Red Hill Project is located on trend and adjacenti to the three multi-million ounce Carlin-type gold deposits (the Pipeline, Cortez Hills and Goldrush deposits) that are amongst Barrick Gold’s largest, lowest cost and politically safest gold minesii.